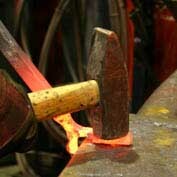 For a blacksmith, the traditional way to cut metal is by chiselling it on an anvil. 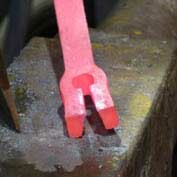 The tools used are much tougher than woodworking chisels. 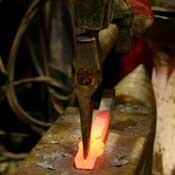 Cutting this way is much quicker, and more convenient, than using a bandsaw, especially if the metal is hot. 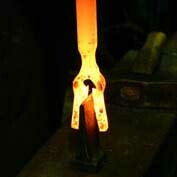 The "buds" above were forged by first splitting a bar of steel lengthways, as illustrated below. 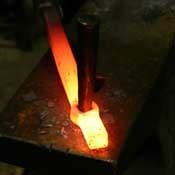 A slit is punched in the steel (which is also the first stage in hot punching a hole). Its rounded corners prevent the metal from tearing when it is opened up in the later stages. 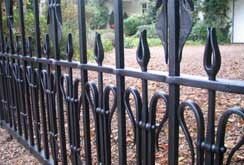 The slit is rounded by pushing the steel to the sides with a tapered drift. The swelling around the hole helps to give the bud its ripe shape. 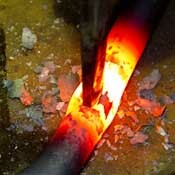 The steel is then slit with a hot cutting chisel. As it gets driven in, the tip gets very hot, very quickly, so needs regular cooling off in water. 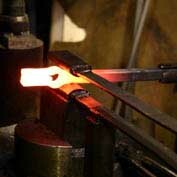 Cutting the steel with a chisel leaves the cut with tapered sides; these will be forged flat at a later stage. The stem is then necked in by spring fullers driven in with a power hammer. The rest of the bar will eventually be drawn down to the same size as the neck. 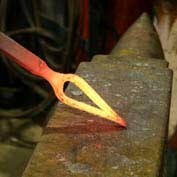 The wedge shaped sides are forged flat on the anvil and then tapered to a more delicate tip. 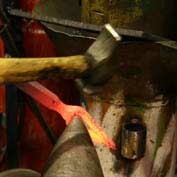 The inside of the split is carefully cleaned up by lightly forging on the very tip of the anvil's horn. All that remains is to open up the tips and the bud is complete. 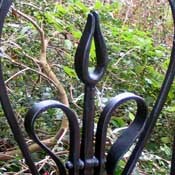 Forging a bud this way is time consuming but the work produced has a refined quality unseen in mass produced components, as this gate shows.